GB RAILFREIGHT has confirmed it will buy 16 Class 56 locos from Leicester-based UK Rail Leasing, which will be used as part of its future expansion. In addition to the locomotives, GBRf has bought spare parts and other materials. 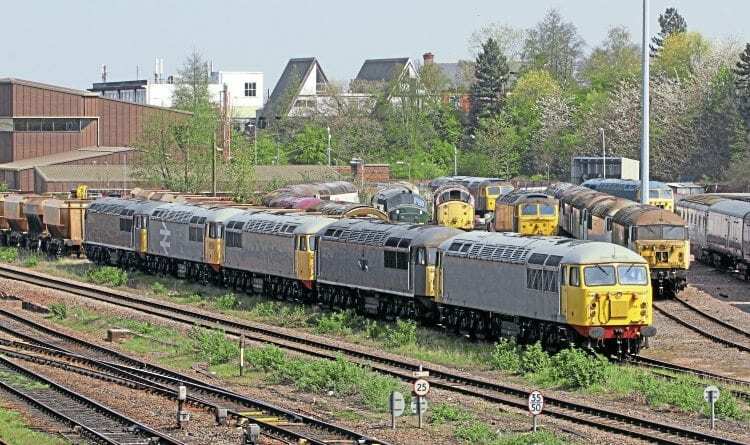 GBRf says the locos are a mix of stored, serviceable and non-running donor locomotives, which GBRf will be able to put to a variety of uses as business demands. Initially, a number of the ‘Grids’ at Leicester were expected to be moved to Longport before the end of June. Paperwork issues did delay a planned move on June 21. At least three locos are operational. Once moved, GBRf will assess each loco pending a decision on their future re-engineering, while others may be returned to service in a shorter timescale. The scope of any re-engineering is subject to ongoing discussions and award of a final contract. When UK Rail Leasing invited the press to Leicester depot in 2015, there was talk then of developing a project to replace the original Ruston-Paxman 3,250hp power unit with a more fuel-efficient engine – one that would meet more stringent emission regulations.